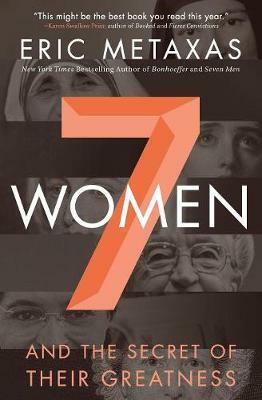 In this highly anticipated follow-up to the enormously successful Seven Men, New York Times bestselling author Eric Metaxas gives us seven captivating portraits of some of history's greatest women, each of whom changed the course of history by following God's call upon their lives-now in paperback. Each of the world-changing figures who stride across these pages-Joan of Arc, Susanna Wesley, Hannah More, Sister Maria of Paris, Corrie ten Boom, Rosa Parks, and Mother Teresa-is an exemplary model of true womanhood. Teenaged Joan of Arc followed God's call and liberated her country, dying a heroic martyr's death. Susanna Wesley had nineteen children and gave the world its most significant evangelist and its greatest hymn writer, her sons John and Charles. Corrie ten Boom, arrested for hiding Dutch Jews from the Nazis, survived the horrors of a concentration camp to astonish the world by forgiving her tormentors. And Rosa Parks's deep sense of justice and unshakable dignity and faith helped launch the twentieth-century's greatest social movement.